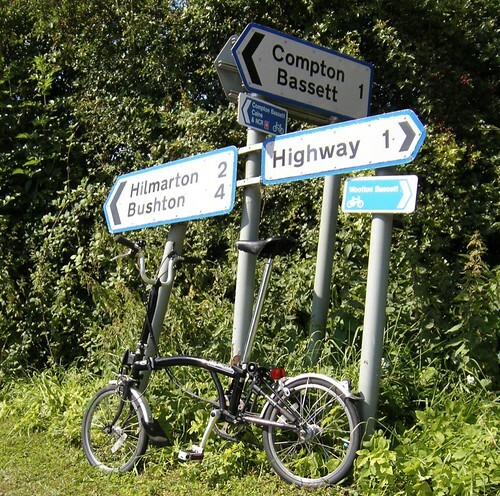 I took the Brompton in the car when we visited my mother today, she still lives in Hilmarton where I was brought up. 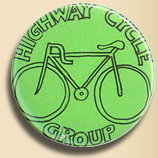 My father moved to nearby Highway not long after my parents split up and it was from his rented house in the tiny hamlet of Highway that he created The Highway Cycling Group. 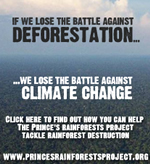 My father died in 1995, and it would have been his 62nd birthday on the 10th of August. I didn’t plan to ride to Highway when I put the Brompton in the boot, but it made perfect sense to do so once I’d saddled up. Even on the Brompton it took only five minutes to reach the turning to Highway, pausing briefly to take a picture of the signpost with my bike. This massively informative and somewhat overdone sign is in the middle of nowhere, but fittingly it has two cycleway signs attached to it. Pleasing to see that the route to Wooton Bassett goes through Highway. Highway itself is small, maybe five houses one of which is a converted church, one farm and a rusting old barn, it’s so small a place that I don’t think it even has a ‘name’ sign telling you that you have entered or left the hamlet. My father’s old place was the first building as you enter from the Compton Bassett side, his was 2 Coronation Cottages, number 1 being the first half of the semi-detached, pebbledashed house. He lived there with his housemate, a fantastic fellow called Francis. Francis got around on a battered old racer from the seventies, I think it was a Peugeot. Often he would wobble back from a meeting of the Compton Bassett Cricket Club somewhat worse for wear having enjoyed too much Wadworth’s 6X. Watching him crashing into the dustbins and falling off the bike it was unclear how he made it back in one piece. He staggered upstairs collapsed into the cane sofa in my father’s study and waved his hand toward my sister and my father’s partner “Send the women away” he exclaimed wearily “they musn’t see me like this” and promptly fell asleep. The old neglected racer was left lying on the pathway, rear wheel spinning slowly, it looked as inebriated as its snoring rider. This house was an ideal base to ride from, hardly any traffic passed down this road and one could get to Calne, Lyneham, Bushton, Spirthill or Hilmarton and back with ease. An old brick shed out the back housed my father’s road bike, and many’s the time it was wheeled out on such a day as this, bright, hot and filled with the sound of crickets in the verges. The road shimmered in the heat-haze as I rounded the corner onto Highway Common. In the gateway of a field a couple were resting having ridden there from somewhere, the woman was on a roadbike, the man sitting in a recumbant, I tinged my bell and they waved as I passed by. The common itself is now fenced into fields, no longer common land, but the long straight stretch remains. This is pure joy to cycle down, no cars, a beautiful narrow lane with lovely views either side and a wildflower covered verge teeming with chirruping grasshoppers and crickets. To the right, sheep grazing contendedly while swallows swoop over their backs, to the left a field of stubble, crows rising as I wheel past. My digital camera has a poor quality video function and I fancied capturing a little of the moment. I got about 30 seconds before the card filled up and later I posted a lo-res version to Youtube. A long time ago I raced a hare down this road by the light of a full moon. Many Highway Cycling Group outings started, or ended with a ride down this lovely stretch of road. Over the staggered junction, past Whitcomb farm and down to the crossroads below Snow Hill. This beacon, so mighty to me when I was young appeared now to be only marginally steeper than Black Dog Hill, and certainly shorter. I was almost tempted to take it on the Brompton, I waited at the junction and watched two roadies take it with reasonable ease, they smiled and nodded as they passed me, everyone likes to see a Brompton out and about. For more photos from the ride, go to my Flickr page.